This is the 13th Construction Phase Monthly EM&A Report for the Project which summarizes the monitoring results and audit findings of the EM&A programme during the reporting period from 1 to 31 January 2017. The key activities of the Project carried out in the reported period included five deep cement mixing (DCM) contracts and an advanced works contract. The DCM contracts involved DCM trials, coring works, laying of geotextile and sand blanket; and the advanced works contract involved horizontal directional drilling (HDD) works including pilot hole drilling, reaming and pipeline supporting works. The monthly EM&A programme was undertaken in accordance with the Updated EM&A Manual of the Project. During the reporting period, the ET conducted 33 sets of construction dust measurements, 20 sets of construction noise measurements, 13 events of water quality measurements, one round of terrestrial ecology monitoring on Sheung Sha Chau Island, two complete sets of small vessel line-transect surveys and five days of land-based theodolite tracking survey effort for Chinese White Dolphin (CWD) monitoring as well as landscape & visual and waste monitoring. Weekly site inspections of the construction works were carried out by the ET to audit the implementation of proper environmental pollution control and mitigation measures for the Project. Bi-weekly site inspections were also conducted by the Independent Environmental Checker (IEC). 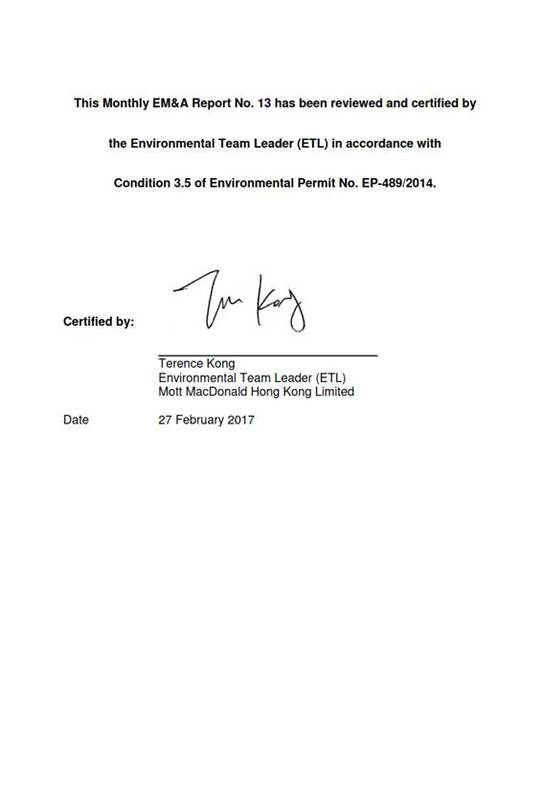 Observations have been recorded in the site inspection checklists, including the observations on dark smoke emission from the construction vessels and the condition of silt curtain for sand blanket laying are provided to the contractors together with the appropriate follow-up actions where necessary. On the implementation of Marine Mammal Watching Plan, silt curtains were in place by the contractors for sand blanket laying works and dolphin observers were deployed in accordance with the Plan. On the implementation of Dolphin Exclusion Zone (DEZ) Plan, dolphin observers were deployed by the contractors for continuous monitoring of the DEZ for DCM trial works in accordance with the DEZ Plan. Trainings for the proposed dolphin observers were provided by the ET prior to the aforementioned works, with the training records kept by the ET. From the contractors’ daily observation records and DEZ monitoring log records, no dolphin or other marine mammals were observed within or around the DEZ and silt curtains in this reporting month. These contractors’ records were also audited by the ET during site inspection. Audits of acoustic decoupling for construction vessels were also carried out by the ET. On the implementation of the Marine Travel Routes and Management Plan for High Speed Ferries of SkyPier (the SkyPier Plan), the daily movements of all SkyPier High Speed Ferries (HSFs) in January 2017 were in the range of 83 to 91 daily movements, which are within the maximum daily cap of 125 daily movements. A total of 868 HSF movements under the SkyPier Plan were recorded in the reporting period. All HSFs had travelled through the Speed Control Zone (SCZ) with average speeds under 15 knots (7.8 to 14.3 knots), which were in compliance with the SkyPier Plan. Two ferry movements with minor deviation from the diverted route are under investigation by ET. The investigation result will be presented in the next monthly EM&A report. In summary, the ET and IEC have audited the HSF movements against the SkyPier Plan and conducted follow up investigation or actions accordingly. On the implementation of the Marine Travel Routes and Management Plan for Construction and Associated Vessel (MTRMP-CAV), ET had conducted weekly audit of relevant information, including Automatic Identification System (AIS) data, vessel tracks and other relevant records to ensure the contractors complied with the requirements of the MTRMP-CAV. Training has been provided for the concerned skippers to facilitate them in familiarising with the requirements of the MTRMP-CAV. 3-month rolling programmes for construction vessel activities were also received from contractors. ET had reminded contractors that all vessels shall avoid entering the Brothers Marine Park, which has been designated on 30 December 2016. The monitoring works for construction dust, construction noise, water quality, construction waste, terrestrial ecology and CWD were conducted during the reporting period in accordance with the Updated EM&A Manual. The water quality monitoring results for DO, total alkalinity and chromium obtained during the reporting period were in compliance with their corresponding Action and Limit Levels. For turbidity, SS and nickel, some of the testing results had exceeded the relevant Action or Limit Levels. Investigations were carried out immediately for each of the exceedance cases. The investigation findings concluded that the exceedances were not due to the Project. The monthly terrestrial ecology monitoring on Sheung Sha Chau observed that installation of casing was conducted on the Island and there was no encroachment upon the egretry area nor any significant disturbance to the egrets foraging at Sheung Sha Chau by the works. ● Erection of site office. 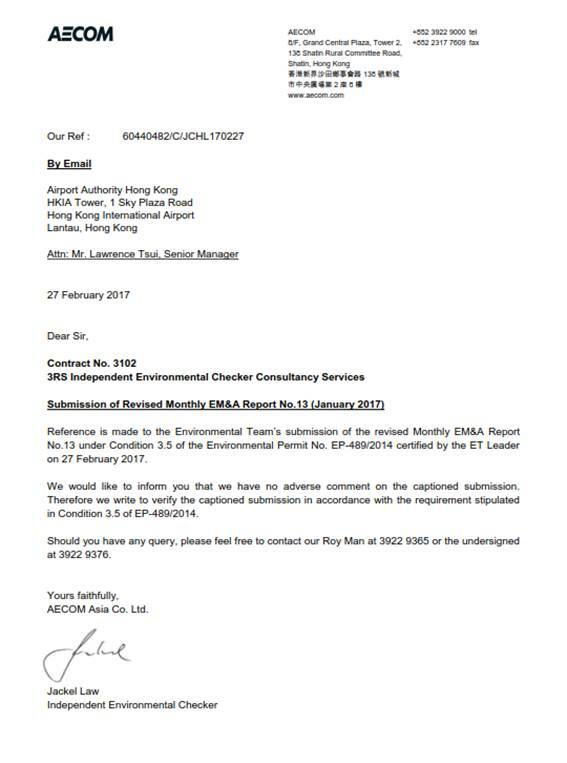 A complaint of night time work and construction wastewater at Sheung Sha Chau was received on 19 Jan 2017. The complaint investigation was carried out in accordance with the Complaint Management Plan. The investigation detail is presented in S7.7.1. This is the 13th Construction Phase Monthly EM&A Report for the Project which summarizes the key findings of the EM&A programme during the reporting period from 1 to 31 January 2017. The key activities of the Project carried out in the reporting period included five DCM contracts and an advanced works contract. The DCM contracts involved DCM trials, coring works, laying of geotextile and sand blanket; and the advanced works contract involved HDD works including stockpiling of excavated materials from HDD operation, pilot hole drilling, reaming and pipeline supporting works. The coral translocation was completed on 5 January 2017. The first post- translocation coral monitoring was commenced on 20 January 2017. Taking into account the construction works in this reporting month, impact monitoring of air quality, noise, water quality, waste management, ecology, CWD and landscape & visual were carried out in the reporting month. Calibration certificates of the sound level meters and acoustic calibrators used in the noise monitoring provided in Appendix B of the Construction Phase Monthly EM&A Report No.8& 9 are still valid. Any updates of calibration certificates will be reported in the Monthly EM&A report if necessary. The calibration certificates of the monitoring equipment used in the reporting month is updated and provided in Appendix B. The water quality monitoring results for DO, total alkalinity and chromium obtained during the reporting period were in compliance with their corresponding Action and Limit Levels. For turbidity, SS, and nickel, some of the testing results had exceeded the relevant Action or Limit Levels. Details of the exceedances are presented in Section 4.5.2. All the water quality monitoring results and graphical presentations are provided in Appendix D.
During the monitoring period in January 2017, testing results exceeding the corresponding Action or Limit Levels were recorded on nine monitoring days. Details of the exceedance cases are presented below. Table 4.7 presents a summary of the turbidity compliance status at IM and SR stations during mid-ebb tide for the reporting month. There were no turbidity exceedances at any IM and SR stations during mid-flood tide for the reporting month. As shown in Table 4.7, exceedances of Action or Limit Level at IM stations were recorded on 31 Jan 2017. Repeat turbidity measurement was conducted at IM8, IM9, IM10, IM11 and SR3 on 1 February 2017 during ebb tide in accordance with the Event and Action Plan of the Updated EM&A Manual. Some of the exceedances occur at monitoring stations which are located upstream of the 3RS Project during ebb tide. As such upstream stations would unlikely be affected by the Project, the investigation focused on the exceedance at IM station located downstream of the Project and hence might be affected by the Project’s construction activities. As part of the investigation on the downstream exceedance events, details of the Project’s marine construction activities on this monitoring day was collected, as well as any observations during the monitoring. The findings are summarised Table 4.8. According to the investigation findings summarized in Table 4.8, it was confirmed that the silt curtain was deployed and maintained properly for DCM works, and no silt plume was observed at the active DCM works area, even though silt plume occurred in the vicinity of IM11 during monitoring. This suggests that the silt plume at IM11 was unlikely generated by the construction works. Repeat turbidity measurement was conducted on 1 February 2017 at the monitoring stations recorded with exceedances on 31 January 2017 in accordance with the Event and Action Plan of the Updated EM&A Manual. No exceedance was recorded during repeated measurement. High level of turbidity at IM11 may be contributed by similarly high turbidity levels at upstream stations (IM8 to IM10) on the same day. Given that IM8 to IM10 are located upstream of the Project during ebb tide, and high turbidity levels were apparent at these locations (which would unlikely be affected by the Project), the exceedance at IM11 was possibly due to natural fluctuation in this area. Based on these findings, the exceedance was considered not due to the Project. At SR stations, exceedance was observed at SR3, however, SR3 is located upstream of the project during ebb tide, hence the exceedance at SR3 is unlikely to be due to the Project. As the repeat turbidity measurements conducted on 1 February 2017 showed no further exceedance, the single exceedance at SR3 may be due to natural fluctuation. Table 4.9 presents a summary of the SS compliance status at IM and SR stations during mid-ebb tide for the reporting month. As shown in Table 4.9, exceedances of Action Levels at IM stations were recorded on three monitoring days. However, some of the exceedances occur at monitoring stations which are located upstream of the 3RS Project during ebb tide. As such upstream stations would unlikely be affected by the Project, the investigation focused on the exceedances at IM stations located downstream of the Project and hence might be affected by the Project’s construction activities. According to the investigation finding summarized in Table 4.8, the silt curtain was deployed and maintained properly for the DCM works, and no silt plume was observed at the active DCM works area. The silt plume observed in the vicinity of IM11 was thus unlikely generated by the construction works. High levels of SS at IM2, IM3 and IM11 may be contributed by similarly high SS at upstream stations (IM6 to IM9) on the same day. Given that IM6 to IM9 are located upstream of the Project during ebb tide, and high SS levels were apparent at these locations (which would unlikely be affected by the Project), the exceedances at IM2, IM3 and IM11 were possibly due to natural fluctuation in this area. Based on these findings, the exceedances were considered not due to the Project. At SR stations, exceedance was observed at SR3, however, SR3 is located upstream of the project during ebb tide, hence the exceedance at SR3 is unlikely to be due to the Project. In addition, it is noted that similarly high SS levels were observed at this SR station during baseline monitoring, which suggested that such SS elevation is not uncommon under ambient conditions due to natural fluctuation. Given these findings, the exceedance at SR3 was considered not due to the Project. Table 4.10 presents a summary of the SS compliance status at IM and SR stations during mid-flood tide for the reporting month. As shown in Table 4.10, exceedances of Action Level at IM stations were recorded on two monitoring days. However, all exceedances occurred at monitoring stations which are located upstream of the 3RS Project during flood tide. Such upstream stations are unlikely to be affected by the Project. Nevertheless as a prudent measure, the Project’s activities on these monitoring days were investigated and it was confirmed that silt curtains were deployed and maintained properly and no silt plumes were observed. Based on these findings and given that exceedances were only observed at monitoring stations located upstream of the Project, these exceedances were considered not due to the Project. At SR stations, exceedances were recorded at SR6 during mid-flood tide for the reporting month. SR6 is located upstream of the project during flood tide, hence the exceedances at SR6 are unlikely to be due to the Project. In addition, it is noted that similarly high SS levels were observed at this SR station during baseline monitoring, which suggested that such SS elevation is not uncommon under ambient conditions due to natural fluctuation. Given these findings, the exceedances at the SR station was considered not due to the Project. Table 4.11 presents a summary of the nickel compliance status at IM stations during mid-ebb tide for the reporting month. As shown in Table 4.11, an exceedance of Limit Level was recorded at one IM station on one monitoring day. However, the exceedance occurred at a monitoring station which is located upstream of the 3RS Project during ebb tide. Such upstream station is unlikely to be affected by the Project. This singular nickel exceedance also appeared to be an isolated case with neither temporal nor spatial trend to indicate nickel release due to Project activities. Based on these findings and given that exceedance was only recorded at a monitoring station located upstream of the Project, the exceedance was considered not due to the Project. As shown in Table 4.12, an exceedance of Action Level was recorded at one IM station on one monitoring day. As part of the investigation on the downstream exceedance event, details of the Project’s marine construction activities on the monitoring day were collected, as well as any observations during the monitoring. The findings are summarised in Table 4.13. In addition to the investigation summary presented in Table 4.13, it is also noted from Table 4.12 that the singular exceedance at one downstream IM station appeared to be an isolated case with neither temporal nor spatial trend to indicate nickel release due to Project activities. Moreover, no exceedance was recorded at other downstream monitoring stations that were closer to the active DCM works, which further suggests the exceedance was not due to Project’s activities. Based on these findings, the nickel exceedance at the downstream station during flood tide was considered not due to the Project. Based on the findings of the exceedance investigations, it is concluded that the exceedances were not due to the Project. Hence no SR stations were adversely affected by the Project. All required actions under the Event and Action Plan has been followed. Exceedances appear to be due to natural fluctuation (such as naturally higher baseline SS levels at individual SR stations) or other sources not related to the Project. Nevertheless, recognising that the IM stations represent a ‘first line of defense’, the non-project related exceedances identified at IM stations have been attended to as a precautionary measure. As part of the EM&A programme, the construction methods and mitigation measures for water quality will continue to be monitored and opportunities for further enhancement will continue to be explored and implemented where possible, to strive for better protection of water quality and the marine environment. In the meantime, the contractors were reminded to implement and maintain all mitigation measures during weekly site inspection and regular environmental management meetings. These include maintaining the silt curtain for sand blanket laying properly as recommended in the EM&A manual. Recommendations including provision and maintenance of spill kits, provision of chemical waste storage area for chemical waste, and proper storage of construction material were provided during monitoring. In addition, the relevant contractors were reminded to provide recycling bins for the segregation of recyclables from general refuse. The contractors had taken actions to implement the recommended measures. Based on the Contractor’s information, about 195m3 of excavated materials were produced from the HDD launching site and Sheung Sha Chau under P560(R) in January 2017. The generated excavated materials were temporarily stored at storage and stockpiling area. The excavated material will be reused in the Project. Around 16 tonnes of general refuse was disposed of to the WENT Landfill by advanced works contract and DCM contract in January 2017. Around 24m3 of Construction and Demolition (C&D) material generated from DCM contract was disposed of as public fill in the reporting month. No chemical waste was disposed off-site during the reporting month. ^Limit Level – two consecutive running quarters mean both the running quarterly encounter rates of the preceding month December 2016 (calculated by data from October to December 2016) and the running quarterly encounter rates of this month (calculated by data from November 2016 to January 2017). For the NWL area, there was no significant demarcation of the 3RS works area by perimeter silt curtains during CWD monitoring survey in the reporting period and the transect lines within the works area could largely followed the waypoints conducted for baseline monitoring. Nevertheless, there was an increase in construction vessel traffic within the 3RS works areas in this month, incurring safety concern on the travelling routes of CWD vessel survey, therefore the transect lines for the NWL area will be revised in the next month to follow the waypoints set for construction phase monitoring. The planned vessel survey transect lines are depicted in Figure 6.1 with the waypoint coordinates of all transect lines given in Table 6.2, which are subject to on-site refinement based on the actual survey conditions and constraints.